(VIDEO) LIGO opens new window on the universe with observation of gravitational waves from colliding black holes. Seven Texas Tech researchers were involved in the collaborative discovery. Gravitational waves carry information about their dramatic origins and about the nature of gravity that cannot otherwise be obtained. Physicists have concluded the detected gravitational waves were produced during the final fraction of a second of the merger of two black holes to produce a single, more massive spinning black hole. This collision of two black holes had been predicted but never observed. 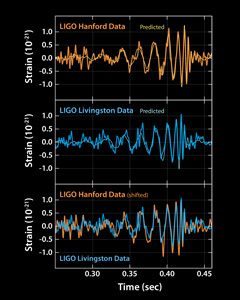 The gravitational waves were detected on September 14, 2015 at 5:51 a.m. EDT by both of the twin Laser Interferometer Gravitational-wave Observatory (LIGO) detectors, located in Livingston, Louisiana, and Hanford, Washington. The LIGO Observatories are funded by the National Science Foundation (NSF), and were conceived, built, and are operated by Caltech and MIT. 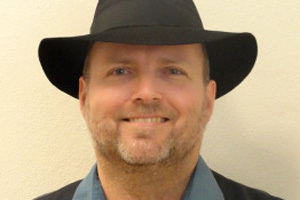 The discovery, accepted for publication in the journal Physical Review Letters, was made by the LIGO Scientific Collaboration, which includes the GEO Collaboration and the Australian Consortium for Interferometric Gravitational Astronomy, and the Virgo Collaboration using data from the two LIGO detectors. Seven Texas Tech University researchers are members of the LIGO Scientific Collaboration: professor Benjamin Owen, assistant professor Alessandra Corsi, postdoctoral researchers Santiago Caride, Robert Coyne, Ra Inta and Nipuni Palliyaguru, all in the Department of Physics; and undergraduate Department of Mechanical Engineering major Chance Norris. One of the two data analysis algorithms that detected the gravitational waves relied on Owen's work in the last 20 years to efficiently search for signals, and Owen spent three years supervising the stress testing of the other algorithm. 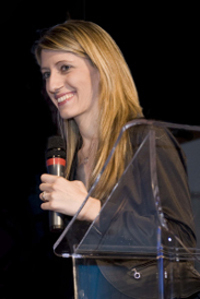 Corsi has worked for years at the interface of gravitational-wave physics and astronomy and is one of the key players in the effort to enable sky searches for electromagnetic counterparts to invisible gravitational waves. 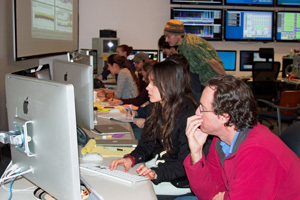 Coyne, Palliyaguru and Norris have joined her in this endeavor, which includes searching LIGO data for gravitational waves that leave detectable electromagnetic signatures. Caride and Inta have worked extensively to assure the quality of LIGO data. The Texas Tech group also looks ahead: All members work on searches for long and short gravitational wave signals from neutron stars, which should be detected in the coming years and will carry information not only on gravity but also on matter under the most extreme conditions in the universe. On December 12, 2014, LIGO Hanford achieved its first interferometer "lock." "Locking" refers to the times during which infrared light resonates throughout the interferometer under computer control. 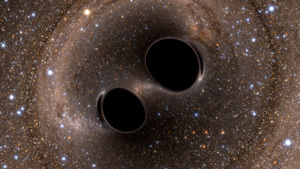 LIGO originally was proposed as a means of detecting these gravitational waves in the 1980s by Rainer Weiss, professor of physics, emeritus, from MIT; Kip Thorne, Caltech's Richard P. Feynman Professor of Theoretical Physics, emeritus; and Ronald Drever, professor of physics, emeritus, also from Caltech. 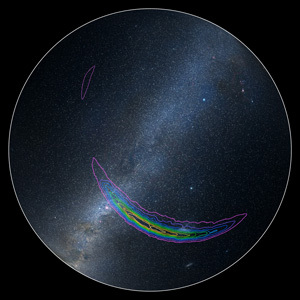 The discovery was made possible by the enhanced capabilities of Advanced LIGO, a major upgrade that increases the sensitivity of the instruments compared to the first generation LIGO detectors, enabling a large increase in the volume of the universe probed – and the discovery of gravitational waves during its first observation run. The National Science Foundation leads in financial support for Advanced LIGO. Funding organizations in Germany (Max Planck Society), the U.K. (Science and Technology Facilities Council, STFC) and Australia (Australian Research Council) also have made significant commitments to the project. Several of the key technologies that made Advanced LIGO so much more sensitive have been developed and tested by the German UK GEO collaboration. Significant computer resources have been contributed by the AEI Hannover Atlas Cluster, the LIGO Laboratory, Syracuse University, and the University of Wisconsin-Milwaukee. 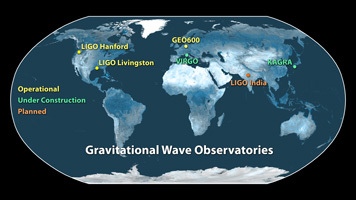 Several universities designed, built, and tested key components for Advanced LIGO: The Australian National University, the University of Adelaide, the University of Florida, Stanford University, Columbia University of the City of New York, and Louisiana State University. The colored lines represent different probabilities for where the signal originated: the purple line defines the region where the signal is predicted to have come from with a 90 percent confidence level; the inner yellow line defines the target region at a 10 percent confidence level. A computer simulation shows the collision of two black holes, each roughly 30 times the mass of the sun, with one slightly larger than the other. The event took place 1.3 billion years ago.